The 2014 Police Security Expo, being held this year in Atlantic City, New Jersey June 24th-25th, is an industry showcase of the latest technologically advanced products and services for the law enforcement community. 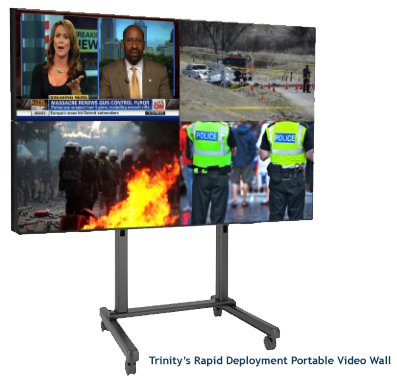 At this year’s Expo, Trinity Video will unveil a new portable and rapidly deployable quad-display rolling cart video wall system designed to create an Emergency Operations Center in locations not readily capable of displaying multiple video sources on a large display system. The system was developed to enhance Command and Control situational awareness for the law enforcement and greater intelligence community as they respond to what are fluid and often volatile situations. Trinity’s Rapid Deployment Portable Video Wall display system is a portable 2×2 (four 55” thin bezel LED monitors) capable of displaying a multitude of layouts – from four single source full screen images (Laptops, PC’s or HDTV Tuners) to one source enlarged to fill the entire four-panel wall. The system is also capable of expanding to include 4 additional display monitors. To learn more about the 2014 Police Security Expo, visit http://www.police-security.com. 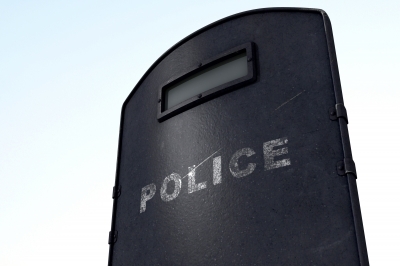 For more information about Trinity Video’s Rapid Deployment Portable Video Wall display system, please contact a Trinity Video Communications Representative today at 1-800-261-9008 or visit our booth at the 2014 Police Security Expo.